Have you started to stockpile on candy yet? Halloween is coming up fast, with ghouls, warlocks, werewolves, and more that will soon be knocking at your door. So why not go a little further this year and really decorate all out? 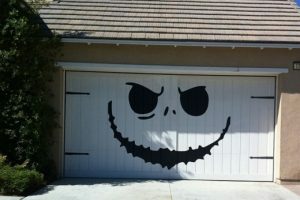 Your garage door is just sitting there, why not make it more festive too! Not sure where to start? We have you covered! Halloween decorations are always spread out through your house and yard, but your garage door gets left out of the fun far too often. You have a giant blank slate just waiting to be redesigned for the occasion! All you need is a little decorations, lighting, and mood music to make the perfect setting for your Halloween fun. Below are some ideas to help you get started on your own decorations for Halloween. Does it seem like your garage door is boring? Do you want to spice up your holiday decor with a ghoulish display? Then you need a garage door cover for your home. There are tons of designs to choose from and it will help you create that spooky look you were going for without spending a lot of dough. You could also skip the store and go straight to work with a blank sheet and make the design yourself! Obviously, the easier of the two is more often than not a trip to the store to find a garage door cover you like. There are goblins, graveyards, ghosts and more to choose from, and that is just the beginning. However, it can be a lot of fun to make the cover yourself. You can even have the kids join in to make it a fun family project! It is a great way to get everyone in the spirit and spend time together at the same time. Halloween is more than just candy, although your kids may disagree. It is a time for harmless scares and spooks for everyone. 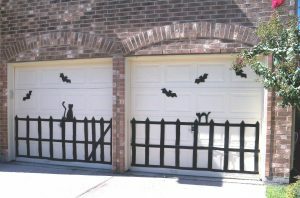 Halloween is the perfect time to create a scary setting for your garage door and driveway. Be creative and you will find so many ways to set a eerie scene for your guests and trick or treaters. Hang a sheet on fishing line for a quick ghost and make it move if you desire, or use some strobe lights for an additional spooky look. Tired of traditional ghosts and monsters? Set up a crime scene in your yard! Use some crime scene tape, black lighting and even create a chalk outline for your setting. You can even take this a step further, put on a show for your guests and candy seekers, dress as the cop, victim, or even the killer and sell your spooky tale! Need more room? Open up the garage for a perfect scene make a crime lab, cemetery, mad scientist’s lab, or anything you can imagine to entertain your guests. You can use props, volunteers, music, lights, and more to really sell your haunting experience. No matter what you choose, have fun with it! Lighting is one of the best effects we have available to us. It can redesign your scene with black lighting, or add a fun design like pumpkin or ghost lights. Make spotlights and attract more to your scene, or simply for a better look. Lighting is a great way to make a more interesting design for your setting. Not into lights? Then maybe creating a movie walk in ( Instead of a drive in) for your lawn. Grab any plain white sheet and cover your garage door and all you need is a projector and movie playlist. You will be the talk of the neighborhood with your horror movies to watch while kids get candy from you, or whatever you choose to play. It is best to have someone out monitoring equipment, so they are a perfect choice for candy duty! Need some repairs or want to replace your garage door before the holiday? Call Clarks Garage Door & Gate Repair to get the job done quickly and efficiently the same day you call. They are the garage door experts and their garage door service technicians are expertly trained and skilled to handle any problem your garage door may have. 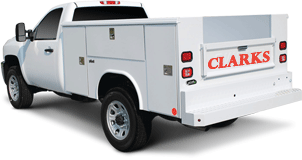 Call Clarks Garage Door & Gate Repair today at (877) 622-8183 for more information or a free quote!